Whether you're simply curious or have already tried a bubble tea or two, you'll quickly find that this popular Taiwanese tea drink comes with many options. There are thousands of possibilities for bubble tea: some types of bubble tea are known worldwide and there are numerous flavors available. Whether you're making bubble tea at home or ordering it at a tea shop, the options can be overwhelming. Let's examine this tasty, chewy beverage and see where you can take your bubble tea. Bubble tea is a style of tea drink that was created in Taiwan in the 1980s. Though it's a subject of debate, it is generally thought that Ms. Liu Han-Chieh of Chun Shui Tang tea shop in Taichung, Taiwan, first came up with the drink. Despite being a relatively new drink, its popularity quickly spread throughout the world. Bubble tea is an interesting beverage that is often made up of black or oolong tea, milk or fruit flavors, a sweetener, and a chewy texture found in Taiwanese cuisine called QQ (what you may think of as the 'bubbles' in bubble tea). Most often, the QQ takes the form of tapioca pearls. The name 'bubble tea' originally came from the bubbles formed when the milk tea was shaken, not the fun pearls inside the drink. Bubble tea is sort of like a milkshake in that it can take on any flavor you like. The variations are seemingly endless because the drink can be made with (or without) many different ingredients. For example, when McDonald's McCafé locations in Germany and Austria began selling bubble tea in June of 2012, they offered a jaw-dropping 250 types of bubble tea. Many bubble tea cafes around the world offer more variations than that. Navigating the vast world of bubble tea can be confusing because of all the factors that differentiate types of bubble tea. 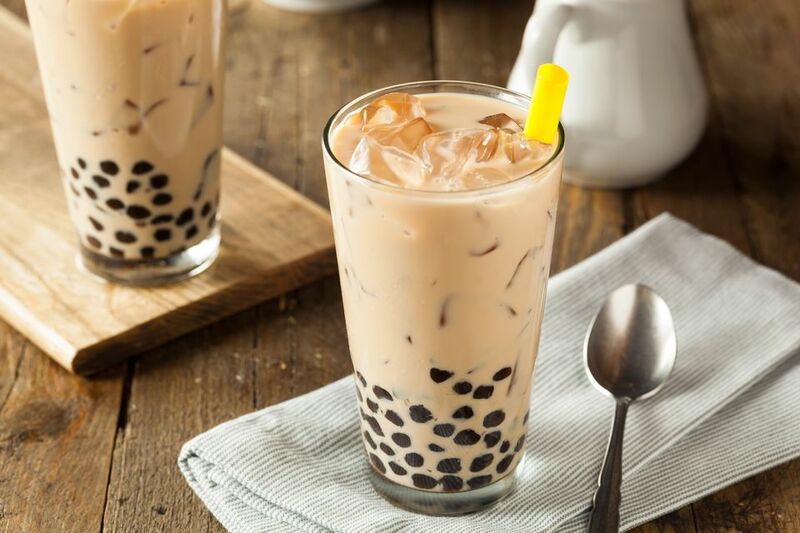 In an attempt to introduce you to this drink, we've outlined some of the most popular bubble teas and the various choices you have when ordering or making bubble tea. Remember that far more bubble teas can be created by mixing and matching ingredients. For example, a strawberry red tea is different from a red tea with Calpis and tapioca noodles. This is different from a taro red tea with Calpis and is also different from a strawberry-taro tapioca noodle red tea with Calpis. Confused, yet? Don't worry, we'll break it all down. To begin, let's look at what is included in the most popular bubble tea recipes. Bubble Milk Tea (or bōbà nǎichá) - A variation on tapioca pearl tea with larger tapioca balls (about 1/4-inch instead of 1/12th-inch). 'Boba' is slang for "large breasts" in Taiwan and parts of China. Black Pearl Milk Tea (or hēi zhēnzhū nǎichá) - Another name for bubble milk tea that uses black pearls as opposed to colored or white pearls. Additionally, these three bubble teas are considered to be 'classic' versions, though they're not quite as popular. Foam Red Tea (or pàomò hóngchá) - A shaken tea with lots of foamy air bubbles. Foam Milk Tea (or pàomò nǎichá) - A milky version of the drink above. Tea Pearl (or chá zhēnzhū) - A less popular and milk-free variation on pearl milk tea or bubble milk tea. Building your own bubble tea drink? The first thing to consider for many people is the type of tea to include. Most bubble teas are made with black tea, green tea, or oolong tea. Black Tea (or red tea, as it is known in China, Hong Kong, and Taiwan) - By far, black tea, especially Earl Grey, is the most popular option for bubble tea. Green Tea - Especially jasmine green tea and green tea powders such as matcha. Oolong Tea - Standard oolong tea is a popular option, though green oolong is another favorite for many bubble tea drinkers. White Tea - Although so-called 'white tea' (though not actually "real" white tea) is a relatively popular option in some Western countries, it is rarely used for bubble tea in Taiwan. As bubble tea has grown, it seems that bubble tea doesn't even have to include tea. Newer variations include "Snow Ice" (a sort of powdered-coffee-based, frozen-and-blended drink), cream-based drinks, and fruit-based drinks that are made without any actual tea. They are sold at bubble tea shops as yet another of the seemingly endless variations on this popular theme of flavored drinks with chewy things in them. Milk and milk-like ingredients are often added to give bubble tea a creamy texture and flavor. Different flavors and styles of dairy and dairy-like ingredients may be used. Some of the sour fruit flavored bubble teas are only available without milk because the acidity of the fruit syrup can curdle the milk. Bubble tea without milk can be ordered as "chá zhēnzhū" (the 'Tea Pearl' referenced above) in Taiwan and China. You have your tea, you have the milk, and we'll get to the QQ in a minute. First, it's time to choose the flavor of your bubble tea. While all of the other ingredients form the base for bubble tea, the true flavor comes from this ingredient. Bubble tea flavors span a great variety, from sweet to savory and fruits to nuts, even bean soup. Quite often, the flavor is added via a syrup or powder, though whole, fresh ingredients are also used. The chewy ingredients in bubble tea are a great example of one of Taiwan's favorite food characteristics: QQ. Although it's something many people in Taiwan crave, it has nothing to do with flavor. Instead, it's all about the chewy texture. Many ingredients (or "toppings" as they are often called, even though they almost all sink to the bottom) are added to teas for QQ. On occasion, they also add some sweetness or flavor. The jellies listed may be in a ball or pearl shape. They may also be cut into strips, "noodles," or other shapes such as cubes or stars. Among the most popular QQ for bubble tea are tapioca pearls, boba, 'frogs eggs,' and taro balls. Tapioca Pearls - Traditionally 1/12th-inch in diameter and black or white in color, though pastel-colored mixtures also exist. Boba - Larger tapioca balls of about 1/4-inch in diameter. "Frog Eggs" (or shān fen yuán) - Made from a type of wild basil seed that, when placed in a liquid, looks amazingly like a bunch of frog eggs. This ingredient has been used in drinks in Taiwan since long before the advent of bubble tea. It used to be harvested along with other herbs in order to make all sorts of traditional Taiwanese beverages. Taro "Balls" (yù tou yuán) - Cooked and often purple in color, these sweet balls are made from the taro plant (a sort of Southeast Asian sweet potato). Taro is often found in Taiwanese cuisine. Your bubble tea QQ doesn't stop with those options, you have many other choices for adding a little 'chew' to the drink. Green Tapioca Pearls - A little green tea is added to tapioca pearls, making these chewier than regular pearls. Cooked Sweet Potato (fan shǔ) "Balls" (yuán) - They're really shaped more like a rolled log that has been cut into small, cylindrical chunks. These are yellow in color. Yù yuán - A colorful mix of taro, sweet potato, or other "balls." Fen yuán - A colorful set of 'balls' that are a mix of taro, sweet potato, and other pieces of material that are just about the shape and size of a piece of Chicklet gum. Longan - Dragon's eye fruit soup that has been dried-and-reconstituted. Lychee Fruit - The flesh of these little tropical fruits is perfect as a QQ with no preparation needed. Sago Pearls or Boba - Similar in appearance to tapioca but made from a different plant starch. These are also used in the Phillippine drink taho. Then, there are the many types of 'true' jellies that can be added to your bubble tea. These are often added in the shape of a ball, though they can take other shapes as well. Coconut Jelly - A nice neutral-flavored jelly. Herbal Grass Jelly - This often has more flavor than most of these QQ toppings. Konjak Jelly - Often used as a sort of vegan gelatin around the world. Aloe Vera Jelly - Typically comes in little cubes. If you didn't think that those were enough options for bubble tea, there are more. We have yet to really scratch the surface, and there are more popular takes on this drink. Bubble tea with added fresh fruit - Especially passion fruit, mango, or lychee. Hong Kong Milk Tea - Usually served hot. Yuanyang - A drink of Hong Kong Milk Tea and coffee that is usually served hot. "Milk smoothies" - Bubble tea minus the tea. Bubble tea with azuki - Azuki is a Chinese red bean and the red bean soup can also be used in bubble tea. Bubble tea with a pudding "topping" - Typically an egg pudding or custard. Chocolate, mango, and taro puddings are quite common. "Snow Bubble" - Iced, blended bubble tea without tea. It is typically made with blended ice, non-dairy creamer, flavors, and boba. In addition, you will find bubble tea in these forms, though they're not as popular as those in the previous list. Bubble coffee or "Snow Ice" - Made with blended ice, powdered coffee, and added flavor. Bubble tea with mung bean soup - When directly translated from Chinese, it means "green bean soup." These are the types of beans used to make Chinese bean sprouts.